I have read that discounting rates differ between different structured settlement annuity types, i.e. period certain annuities are calculated for the period of future cash flows, while life contingent products consider the life expectancy of the payee and thus are calculated accordingly when discounting to present value. Personally I don't understand completely, what does a structured settlement have to do with period certain or life contingent annuities? Well, period certain I can understand, as the settlement is structured for a given period of time, but can structured settlements be built for the life of a plaintiff, or is it common to be done so? Let's say the personal injury claim was for a really young person and the injuries warrant a very large amount of compensation - is it customary to arrange life-long payments similar to retirement annuities or life insurance policies? One thing I feels is really important to point out is that when talking about financial calculation and rates there are so many variables involved and the lay person may not have a good understanding of it all. For example, in my finance, micro-economics and business management classes I was taught about future value, present value, time value of money, compounding, market rates, IRR (Internal Rate of Return) and so on and so forth, much of which is really important to understand also when selling structured settlement payments. Essentially, structured settlements value will be calculated by a discount rate, but the Effective discounting rate is what really matters and what a payee would need to know in order to understand how much he would get paid for selling his payments. This is not at all the same thing as the internal rate his money was going to grow over the payments period. That is a separate thing, and it is the interest he was going to collect on his funds, and that is much lower than the discount rate at what his future payments are discounted now when selling the settlement. I'm well aware that this whole discussion may be confusing to regular people not trained in finance, perhaps most of the personal injury claimants. But the structured settlement consult, attorney, broker, whoever is going to arrange the original settlement, or more so the transfer of a structured settlement, would be expected to explain it all to the client. They should know the difference. When they get their payments, there's a low interest growth accumulated, and it will be internal, defined and fixed; and when they are selling their structured settlement to others, their money will be discounted much more than their original claim minus the fixed interest. It will be discounted at a much higher rate, the effective rate, that is. They'll end up with far less money than the original amount minus the interest. In effect, they will not only not earn, but will LOSE money; their principal will be reduced. I hope it's somewhat clear what I'm saying as I'm aware of the difficulty to explain in a posting. Please see my attached infographic of the loss resulting from selling a structured settlement compared to future payments gains. In the graphic, what you see is a time 0 plus 2 periods. In time 0, the payee gets the original compensation in the amount of 1,000. In period 1, the money has accumulated a 0.024 interest gain; it would gain further and the compounded interest would amount to 1,048.578 in period 2. 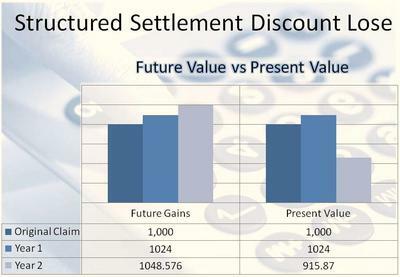 However, if sold at a discount rate of 0.07, the owner of the structured settlement would get only 915.87 - less than the original amount - as its present value. It's a simplified scenario w/o any payouts, just to illustrate the idea. To explain in a nutshell for those who aren't familiar: discount rate means the method to "bring back" the value of the future payments to today's "present value," which is less (actually today's money is worth "more" in terms of purchasing power). It is estimated based on the federal rate. Join in and write your own page! It's easy to do. How? Simply click here to return to PresentValueOfAnnuity.